The Canonsburg Pottery Company was founded in 1909 in Pennsylvania, and for over 65 years created some of the finest dinnerware in the United States. Renowned for its decaled china, the company went out of business in 1978. Keystone is not a pattern but rather a shape onto which patterns were decaled. Plates have fluted edges, similar to the head of a key. The salad plates are almost square, with the corners rippled. If you have plates that vary in age, you can take steps to artificially age them for a more consistent look. 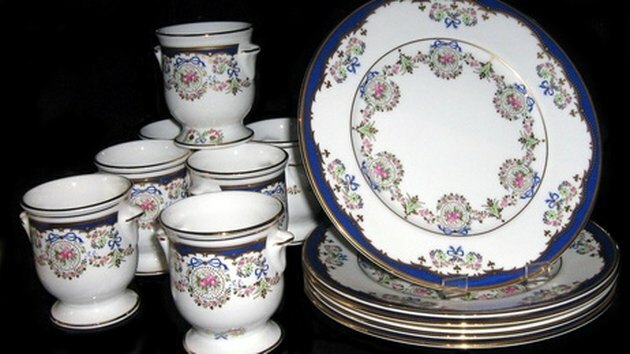 Reglazing techniques can turn any dinnerware, including Canonsburg, into instant antiques. Wash each piece thoroughly in a mixture of liquid detergent and water. Any oil residue, even from your fingers, can prevent the glaze from sticking. Wear rubber gloves when drying the piece. Dry thoroughly. Heat each piece in the microwave or oven. Spray the piece with a sticky hairspray or brush on glue. This will be the base needed to make the glaze stick to the glaze that is already on the plate. Let dry thoroughly. Mix wood stain or acrylic paint with glaze. Use one part stain or paint to two parts glaze. Sponge onto the plate over the base coat of glue or spray. Let dry thoroughly. Fire the piece in a kiln and let it cool overnight. Becky Lower began writing professionally in 2004. Her work has appeared in "elan" magazine, a northern Virginia publication, "Good Old Days" magazine, the "BGSU Alumni" magazine and on the website thenovelette.com. Lower has a Bachelor of Arts in journalism and English from Bowling Green State University.